Welcome to the noisy world of ordinary to extraordinary! Make noise-making devices using everyday materials like pencils, marshmallows, fruits, Play-doh, and more. Sketch, code, and play a musical drawing that really sings. Design your own fun musical devices and games, tinkering with many different materials and surprisingly conductive objects. 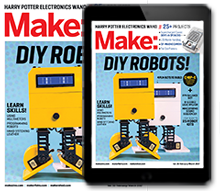 Experiment with sound projects and games like making a fruit piano, paper circuit turntables, an interactive mini-golf course, and a Makey operation game. Share your creative projects, and make some noise! As a starter project, let’s make an interactive drawing that plays music when you touch it. Using a Makey Makey board and Scratch programming environment, you’ll explore and experiment with conductive and non-conductive materials and learn to code a simple computer program. MaKey MaKey kits, which include a circuit board, alligator clips, and a USB cable, are available at makeymakey.com. Computers with Scratch. You can use the online version of Scratch at scratch.mit.edu or download and install the offline editor from scratch.mit. edu/scratch2download. Get ready for a playful session experimenting with sounds and music! You’ll need the MaKey MaKey invention kit. You’ll also need a computer running Scratch, a free creative programming environment. Watch the introductory videos for MaKey MaKey and Scratch, and try exploring the “getting started” guides for each of the tools. Arrange the materials: Lay out paper, pencils, and clipboards on a table for the first activity. In addition, for the Open Make time, set up a side table with a variety of conductive and nonconductive materials. * Attach alligator clips to each of the MaKey MaKey arrow key ports (up, down, left, right) and one to the Space key port. In addition, attach one alligator clip to one of the ports labeled Earth. (You may want to use the black wire for Earth so that you can remember which wire is ground.) their LED light up, introduce this basic layout that they can use to make their circuit on paper. You can hand out printed copies, or you can draw the diagram on a board for everyone to refer to when they are making their own. Insert a piece of paper into the clipboard. Use a pencil to draw a star or other solid shape on the paper. Draw a thick, dark line from the shape to the paper’s edge. Attach a wire from Earth on the MaKey MaKey to the metal clip on the clipboard. Clip one of the wires from a MaKey MaKey port, such as the up arrow,to the end of the line you drew. Touch the metal clip with one hand, then touch the shape to hear the note play. Now draw more shapes so that you can attach each shape to one of the MaKey MaKey ports (the up, down, left, and right, arrows and Space). You can use the MaKey MaKey to demonstrate the difference between open and closed circuits. To activate a key on the MaKey MaKey, you need to make a closed circuit. If you only touch a wire going to Earth on the MaKey MaKey, you have an open circuit. If you also touch a wire going to a MaKey MaKey key port, you have a closed circuit, with the electricity flowing through you. The computer will think you pressed a key! Now you can play your musical drawing. If a circuit isn’t working, first check that the connections are strong. Check the alligators clips on the MaKey MaKey to make sure they are securely attached and that they are not touching each other. Make sure one alligator clip is attached to a thick graphite line on your drawing and that the alligator clip from Earth on the MaKey MaKey board is attached to the metal clip on the clipboard. Make sure the lines you draw are bold, solid, and thick. Make sure the lines don’t overlap. If you see any areas where the graphite from one line touches another, you can remove it with an eraser. Test the Scratch piano (or other program you are using) by pressing a key on the computer keyboard to make sure it works. For more troubleshooting tips, see makeymakey.com/howto . Conductivity: Conductivity refers to the flow of electrons in a material. Conductors: Some metals, such as copper, conduct electricity better than others. Pencils have enough graphite (a semimetal) in them to work as a conductor, so you can “draw” a conductive path that allows electrons to flow to the MaKey MaKey. Examples of materials that also have conductive properties include moist fruit, modeling clay, and even the human body. Insulators: On the other hand, some materials keep their electrons close and tight. Plastic, rubber, fabric, glass, and wood don’t conduct electricity. These materials make good insulators. Introduce the concept of conductive materials by demonstrating how a banana, a foil pan, or modeling clay can be connected to the MaKey MaKey board; then touch the conductive object (while also touching the Earth port) to trigger a sound in the Scratch program. Suggest that makers work in pairs to experiment with using conductive (and n onconductive) m aterials. T hey c an di sconnect t heir m usical drawings and experiment with using other materials to trigger the sounds on the Scratch piano. Playing with MaKey MaKey boards is a fun way to test the conductivity of materials in the world around you. Try funny or unexpected objects, materials, and foods to use as conductors. Mentors from the Flagship Clubhouse at the Museum of Science in Boston encouraged their makers to test the conductivity of canned spray cheese. They created a circuit conducting electricity all the way around the table! Did you enjoy building your own musical device? What was the most surprising conductive material you hooked up to your MaKey MaKey board? What else would you like to try? Can you sketch your project ideas? How would you explain how your project works? Who helped you with your project? What did they do to help?